Clear Polypropylene Mounting Corners by Lineco offer a quick and easy way to mount prints or artwork to mats or backing board. MC3 provides 1 1/4" full view corners for pieces up to an 11" x 14" size. Ideal for artwork, photographs, documents, and certificates. 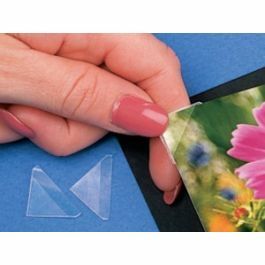 Acid- and static-free, these acrylic adhesive squares are pressure-sensitive and virtually disappear on the page. The full view style provides the maximum display of your work. Mount and protect precious art and prints with our line of Lineco Polypropylene Mounting Corners. 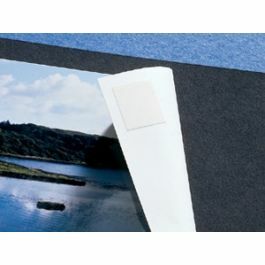 These MC3 Clear Polypropylene Mounting Corners provide archival mounting for artwork, photographs, documents, and certificates. These corners measure 1 1/4" and work well for light to heavyweight artwork and prints up to a 11" x 14" size. MC3 features the full view style, which is cut to minimize the border that is covered. Made with a non-yellowing acrylic adhesive, the corners are free from harmful chemicals and feature a pressure-sensitive application. Press the square into place to secure to mats or backing boards without any sticky glue mess. These mounting corners are ideal for a permanent and secure installation.